Comics adaptations of movies are pointless cash-ins at best--movies that don't move with inaccurate drawings of the actors and scenery. Wolk talks about movies, but the same applies to TV shows, but even more so because we could see that the drawings didn't really capture the characters all that well on a weekly basis. The advantage here is obvious: these guys had much more staying power than your average TV show; Lewis' career in film was over 20 years long and Hope managed to stay atop theater marquees for even longer. Although oddly the book was actually originally published by Classics Illustrated in England and DC's sales were disappointing, probably because the comic was released several months before the movie hit the big screen in the USA. For whatever reason, Marvel had almost no licensed properties during the Silver Age; I believe the lone exception is the Conan the Barbarian title which first appeared in 1970. 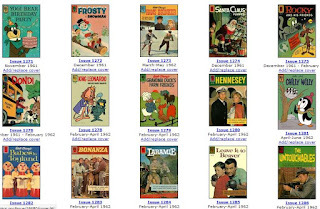 Several animation favorites (Yogi Bear, Rocky & Bullwinkle, King Leonardo, Chilly Willy), some TV shows (Hennesey, Bonanza, Laramie, Leave it to Beaver and the Untouchables) and Walt Disney (Hans Brinker & the Silver Skates, Grandma Duck and Babes in Toyland). Dondi was a long-running comic strip about a war orphan adopted by soldiers. Dell and Gold Key had a very long and profitable relationship with Walt Disney. 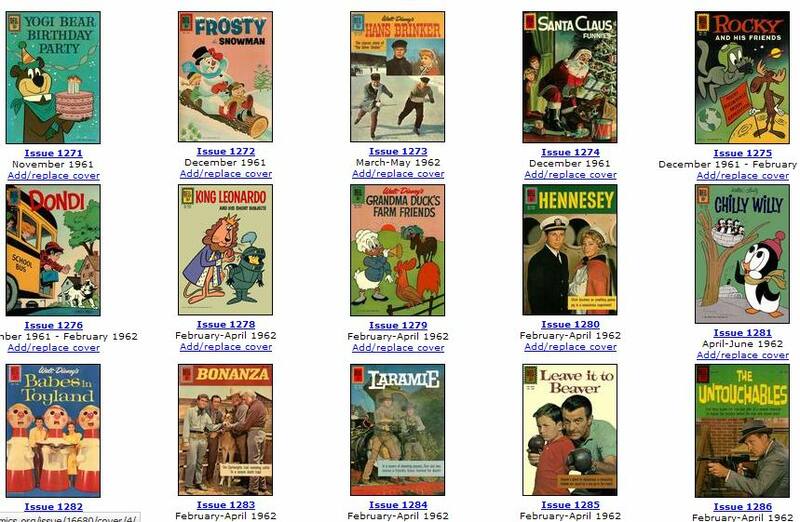 Western Publishing licensed the Disney properties for comics and other publication, put together the comics, and then had Dell distribute them until 1962, when the two companies had a falling-out. Dell published hundreds of Disney comics during the 1940s and 1950s, including the famed Donald Duck series, which is one of the few examples of a licensed character being more successful and popular in the comics than he had been in his original medium. Run, Buddy, Run was a short-lived comedy about a guy on the run from the mob. Redrawn Faces in MSH #14? 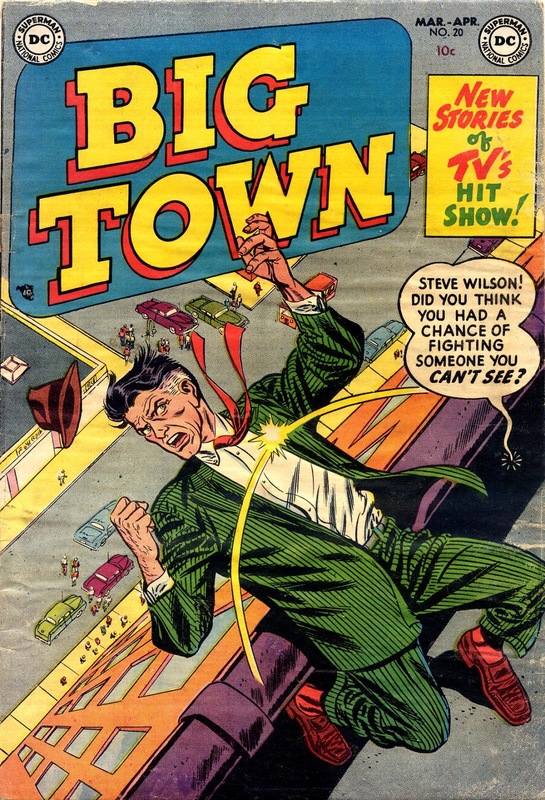 It is well-known that when Jack Kirby came over to DC in the early 1970s and started working on Jimmy Olsen as well as other titles, that Superman and Jimmy Olsen's faces were redrawn by DC staff artists like Al Plastino and Murphy Anderson. But it appears that this practice actually started at Marvel. I've already talked about the bizarre one-off Amazing Spiderman story that appeared in Marvel Super-Heroes #14. 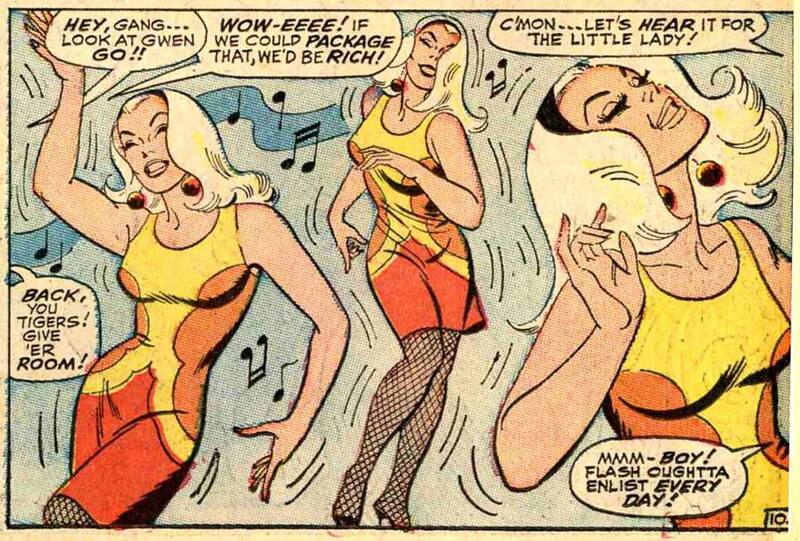 At least according to a note Stan appended to that story, Johnny Romita was ill and so Ross Andru was pressed into service to fill in for the Jazzy one for a single issue. 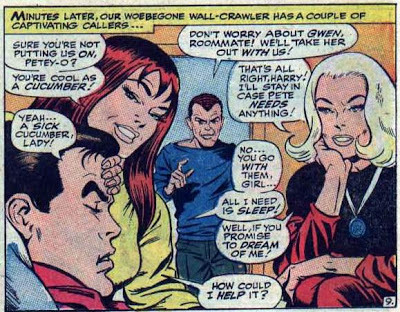 But Romita apparently recovered and met the deadline, so the story was shelved. Why the scare quotes? Well, it turns out that a few of these stories never existed. 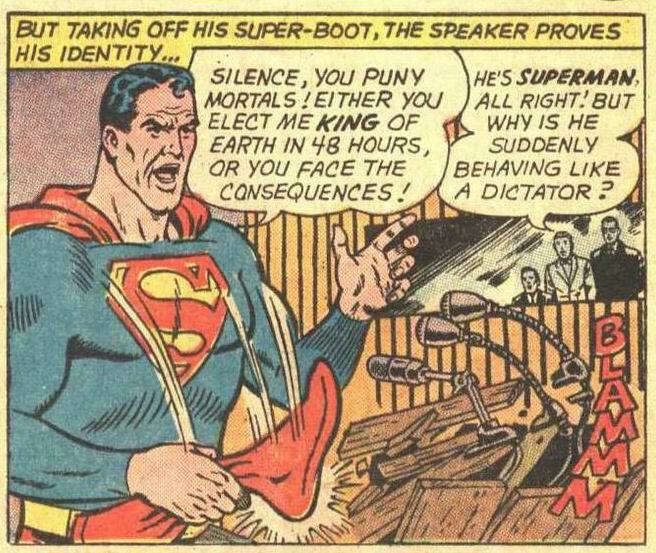 Action Comics #20 is the January 1940 issue, and the (untitled) Superman story in that issue has Superman dealing with a headstrong actress; Lois doesn't even appear in there. 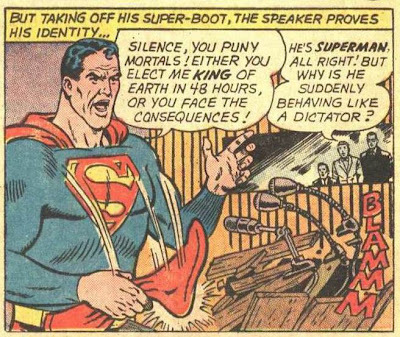 The May 1944 issue of Superman is #28, and it doesn't include any story with Lois on Krypton; at that point Superman didn't even know the name of his home planet. Lois did not commit any crimes, perfect or flawed in the November 1945 issue of Superman, although she did meet a modern Annie Oakley in May 1951 (Superman #70). 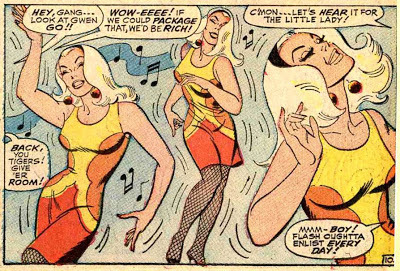 She was featured in Mrs Superman (Superman #76) and wanted in Action #195, and had six lives in Action #198 and X-ray vision in Action #202. 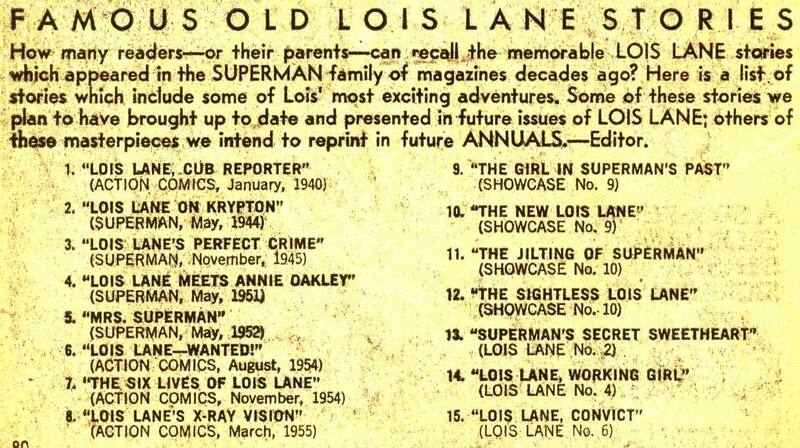 The stories listed in the Showcase tryouts and Lois's own magazine are real, so overall, there were three stories (the first three) that never existed, out of the fifteen. The others ["Lois Lane's College Sweetheart" (Action Comics, March 1939); "Lois Lane on Krypton" (Superman, May, 1944); "Lois Lane's Super-Dream" (Superman, August, 1945); "Lois Lane in Smallville" (Superboy, July, 1945); "The Girl of Gold" (Action Comics, June, 1952); "When Lois Met Green Arrow" (Adventure Comics, December, 1952); and "The Luck of Lois, Lana and Lori!" (Showcase No. 8)] were invented for this list for reasons that will almost certainly remain unknown. Well, my guess is that Weisinger just didn't care if he got that list right; back then the assumption was that nobody would ever check this stuff. 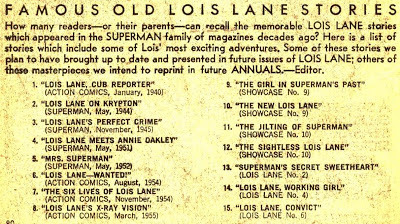 There are some pretty obvious problems with the above list: Superboy didn't have his own magazine until 1949, and Showcase #8 was a Flash issue, not a Lois Lane tryout. 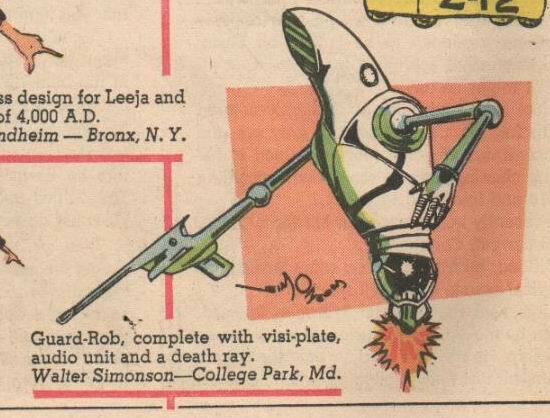 Walt Simonson's First Published Work? From Magnus, Robot Fighter #10, May 1965, about 8 years before his first official work for DC (Weird War Tales) and about the same amount of time before his famed work on Manhunter, one of my favorite series of all time. 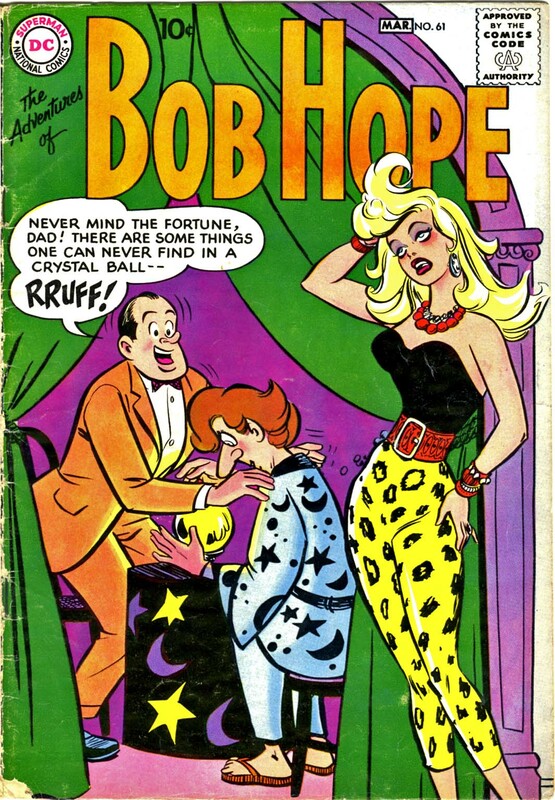 When I was young, before I started collecting comics (I collected and traded them between 1960 and 1966) I used to read my uncle's. This would have been in the very early sixties, 1961 to 63 probably (he was about 16). I remember him having many comics that had a serial for a few pages in the back of (main) comic book I’m not sure who the publisher was, could have been Charlton, DC, I don’t remember, although it was before Marvel and Gold Key. In any case, in the serial I’m hoping to chase down, the main character(s) for what i can remember were in contact with another race of advanced men who had tall heads, sort of like an Egyptian pharaohs’ crown and I think their bodies were colored, like light blue or green or? I can’t remember too much. 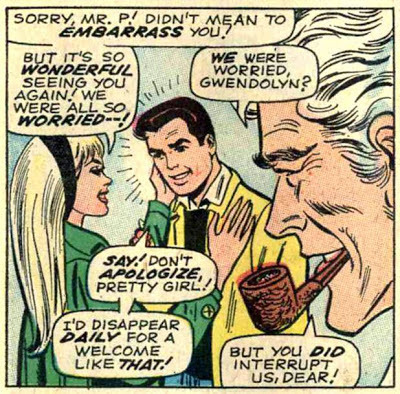 I remember these people were found behind a wall or partition, almost like another dimension and our main characters were interacting with them somehow when they came in contact with them. Sorry it’s not much, but does it ring any bells? 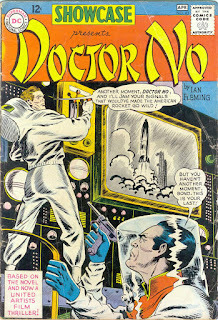 My uncle only had comics like war comics, Magnus Robot Fighter, DC, Charlton, was there an AC? Comments by Pat: I suggested The Aliens from Magnus, Robot Fighter, but after reading my post on them, Darell responded that while he remembered that series, it was not the one he had in mind. Any ideas, fellow Silver Age fans? I don't think it could be Marvel, because it doesn't fit the serial requirement. Despite what Darell says, I would not rule out Gold Key; they started publishing in 1962, so they would not be entirely outside of the 1961-63 timeframe he mentions. I don't think it could be ACG; they didn't have any serials that I can remember in any of their science-fiction books. Charlton, or Dell, maybe? Did he or didn't he? A KGB general remembered that Khrushchev banged the shoe rhythmically, "like a metronome." A UN staffer claimed Khrushchev didn't remove his shoe ("he couldn't have," she recalled, because the size of his stomach prevented him from reaching under the table), but it fell off when a journalist stepped on his heel. The staffer said she passed the shoe wrapped in a napkin to Khrushchev, after which he did indeed bang it. Viktor Sukhodrev, Khrushchev's brilliant interpreter, remembers that his boss pounded the UN desk so hard with his fists that his watch stopped, at which point, irritated by the fact that some "capitalist lackey" had in effect broken a good watch, Khrushchev took off his shoe and began banging. When I talked about Khrushchev to veterans of his era in Washington, one eyewitness confirmed the banging. But another eyewitness confirmed the nonbanging. A third, who said he'd been standing several feet behind the premier, insisted that the heel of the hand that held the shoe slammed the desk but that shoe never actually touched it. So we may never know if Kruschev actually banged his shoe or not. Superman? Hey, it's there in living color.